That was my initial reaction after hearing that USC was heavily involved in courting Kliff Kingsbury. Because for the first time in a while, USC is looking in the right place when it comes to shaping their football staff. 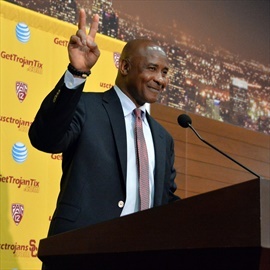 Athletic Director Lynn Swann was a USC Football Letterman from 1971-1973 and one of many alumni working within the athletic department. For starters, not too close to home. This is well-trodden ground by now but it cannot be said enough: Things go better when USC ventures outside of its alumni network. Simple results bare that out — 10 of the Trojans’ 11 national championships were won by head coaches with no prior ties to the university — as does simple logic. No one improves by remaining stagnant and the fastest path toward inertia is through remaining beholden to the same old ideas, that come from the same minds, who came of age in the same place. Even if Kingsbury weren’t such a lauded play caller, merely being steeped in a football tradition so unlike USC’s benefits the Trojans by offering something fresh to incorporate. We saw that on a position-coach level just two seasons ago with Deland McCullough, who was brought on for no other reason than he was good at what he did and immediately breathed new life into the running back room largely through his unorthodox — yet extremely effective — battery of coaching techniques. However and wherever USC goes about filling its remaining vacancies, it should be with a spirit of new blood in mind. That said, there is a limit to how far USC should stray and that outer boundary is the pro game. The allure of the NFL is obvious. It’s comprised of the very best football talent on earth, which in turn suggests that this is where the premier coaches can be found, too. And, in many cases, that’s correct: There is no reason to ever doubt Bill Belichick and Sean Payton’s bona fides. But unlike basketball, where progress trickles down from the NBA, football is a game where cutting-edge thinking matriculates upward. The spread concepts that will continue to dominate the game’s immediate future trace their deepest roots to the high school level and have been further honed on the college scene. Only recently, in offenses like Kansas City’s and Los Angeles’, are we truly seeing it manifest in the professional ranks. Back in the Pac-12, Chip Kelly’s recruit-to-scheme plan should allow USC to continue to win many battles in Southern California. Given that, why should college teams look to hire from a league that is only beginning to adopt and counter strategies that may already have been improved upon at this level? That, before considering other fundamental differences that can stymie coaches who drop down, like fewer hours of hands-on teaching time and the expectation to recruit year-round. 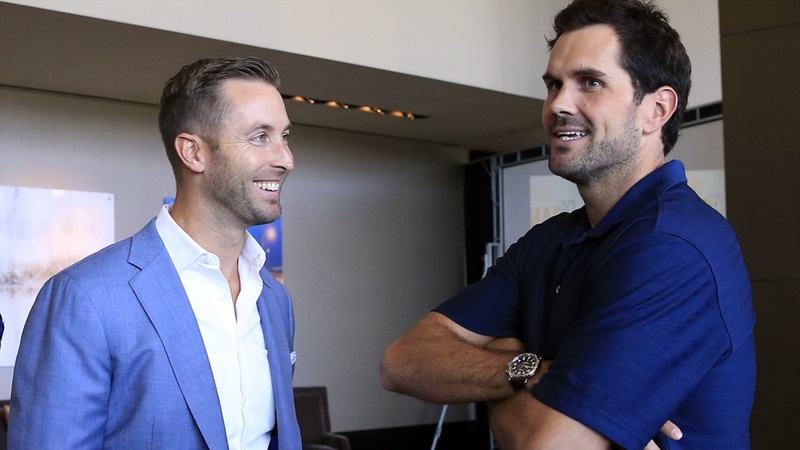 It’s lower risk and possibly even higher reward to cobble together a coaching staff culled from the college ranks, ideally one that’s a mix of hungry up-and-comers and old heads who have proven their worth across multiple Power 5 programs. Another benefit? They’ve had years to develop recruiting ties. Make no mistake, any and every coach on at a school like USC needs to recruit at a high level. There is, of course, the old maxim that “USC recruits itself,” one that isn’t entirely groundless between the Trojans’ history as the unparalleled power in California and Chip Kelly’s UCLA staff seemingly more focused on locating schematic fits versus competing for the majority of the best in-state talent. For the foreseeable future, at least, USC can still get much of what it wants in Southern California, as well as the state at-large. But if USC can recruit itself, then Alabama damn sure can. Ditto Clemson and Georgia. The difference is, all three of those schools have a coaching staff chock full of recruiters, the sort that not only vacuum up their in-state talent but also close on national targets at a level that USC frankly hasn’t operated on in several years. It’s not a coincidence that they’re firmly in the national title conversation. The implications are two-fold. First, no matter how deep California and the surrounding region is, USC isn’t contending for national championships again until it has the capacity to recruit east of Utah for positions of need to compensate for talent shortfalls in its own backyard. 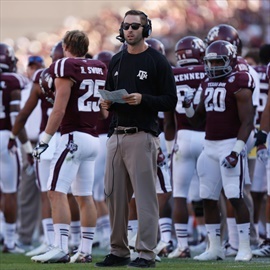 Kingsbury has had success with inherited offensive talents dating back to his time at Texas A&M. 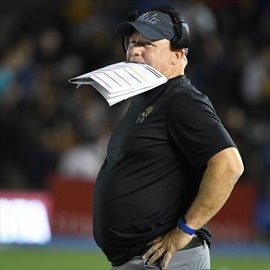 Second, with a thin support staff to fall back on, the margin for error in-region can be razor thin if even a single coach doesn’t pull their weight on the recruiting trail. The recruiting effort on the offensive line over the past two years is testament to that fact, beginning last year with Jackson Carman’s comments and culminating this year, when the Trojans are scrambling to fill up a large class despite an abundance of talent in-state. The on-field product matters, of course, but it’s telling that the same swoon hasn’t dented wide receiver recruiting, for instance, where Tee Martin did his usual strong work to position USC for another big class, at a spot where the depth chart is far less favorable for immediate playing time than in the secondary. It would be unfair to paint Kingsbury as a superstar recruiter but he’s willing to do it and he’s a genuine draw for skill position players. Combine that with how he thinks and where he comes from, and he represents a badly needed infusion of so many things USC could use more of. With several positions left to fill, Clay Helton would do well to make it the start of a trend, not an anomaly.